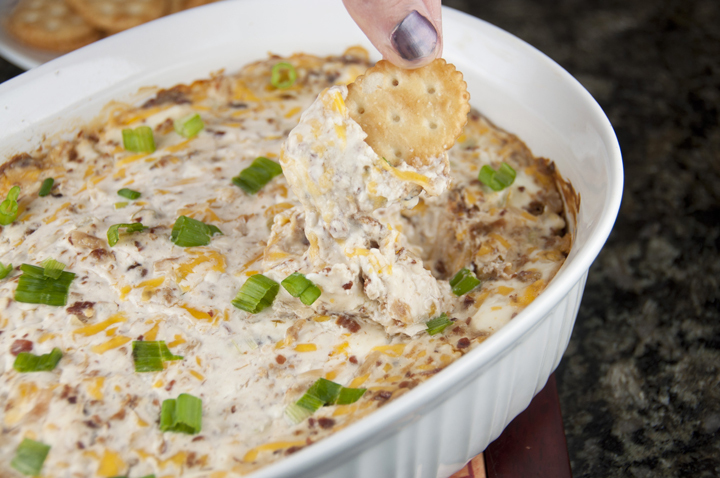 Creamy Bacon and Cheese Dip is the perfect, cheesy appetizer recipe for game day or any party - especially for the Super Bowl! In a mixing bowl, stir together sour cream and cream cheese. Fold in shredded cheese, bacon bits, green onions and onion soup mix. Pour into a 1.5 or 2-quart ungreased baking dish. Cover and bake in oven for 25 to 30 minutes or until hot and bubbly. Once out of the oven, sprinkle some of the green onion on top for a nice presentation! Serve with crackers and/or assorted fresh vegetables.